Looking for the user manual? Or search our Samples/Files/Manuals section! We have hundreds of manuals added to the site! You'll see this reminder one more time after which it will not appear. The Fairchild 670 has attained legendary, and almost mythical status as a piece of recording studio equipment and carries a price-tag to match if you can find one for sale... You can get a UAD plugin emulation of this beastie if required cos let's face it; the chance of owning a real one is... well there's not much chance, lol... read on! 1. Complete absence of audible thumps normally associated with other limiter designs and a complete absence of distortion or noise normally associated with conventional limiters. 2. Extremely fast attack time, the FAIRCHILD 660 or 670 can produce full limiting in the first 5.000th of a second. 3. Variable release time. 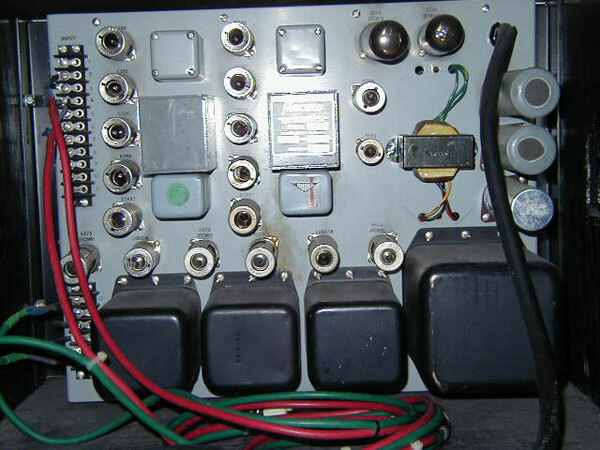 The FAIRCHILD 660 or 670 allow a variable from .3 of a second to 25 seconds, conveniently available on the front panel in the form of a 6-position switch. 4. Can be used as a limiter or a compressor depending on the program material and personal preference. 6. Two models available: single channel Model 670 or the unique stereo model 670. The FAIRCHILD limiter is available in two versions - the monophonic single channel unit, the Model 660, and the unique stereo version, the Model 670. The following basic design points apply to both. The basic design uses a singl push-pull stage of amplification with an extremely high control voltage. The result: the unit never produces any audible or observable thumps and, unlike other conventionally-designed limiters, the unit has extremely low distortion and noise under all conditions, either as a limiter or a straight through amplifier. The attack time is very fast - 50 microseconds (1/5000 of a second) - and catches short transients that can, in other limiters, negate the limiting effect. The release time of 3. to 25 seconds provides real flexibility. Three positions (six are available) make the release time a function of program material, fast recovery of program level should the program level remain high. Ample and accessible input controls, threshold controls, attack and release time and metering controls. The unit can be used as a limiter or compressor, depending upon personal taste and program material. A 2 to 1 ratio as a Compressor with a threshold 5b below average level, and as a peak limiter with a 30 to 1 ratio with a threshold 10 db above normal program level. The unit can also be adjusted to operate anywhere between these two extremes. Reliability and stability: all components operate well below their rated maximums, insuring, trouble-free performance, and guarantee of day-in-day-out performance results. Masters made one day can be duplicated months later and with the same control settings. Two models are available : the single channel monophonic version, model 660, or the versatile two-channel stereo version, model 670. In addition, the Model 670 is designed for stereo level control problems specifically. The 670 on one chassis incorporates two independent limiters that will act on left and right channels or which will act on the lateral and vertical (sum and difference) components of the two stereo channels. This latter is accomplished by first bringing the two stereo channels through a matrixing network and then dividing them into their respective lateral and vertical components, limiting these lateral and vertical components and then combining through a second matrixing network into left and right channels again. Using this FAIRCHILD matrix limiter design, thousands upon thousands of stereo masters have been cut with maximum useable level and efficient use of available groove space, resulting in high level recordings with long playing times.This Limit-Matrix system of the 670 now finds the same importance in the new art of stereo broadcasting. 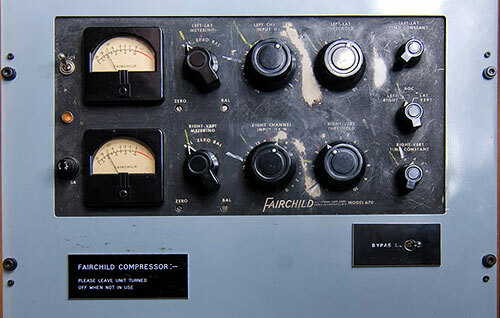 No wonder that the FAIRCHILD limiters are used by the major labels and major recording services and quality conscious radio stations throughout the world. FREQUENCY RESPONSE: 20 cycles to 15 kc +/- 1db. RELEASE TIME: Position 1: .3 sec Position 2: .8 seconds Position 3: 2 seconds Position 4: 5 seconds Position 5: Automatic function of program material: 2 seconds for individual peaks. 10 seconds for multiple peaks. 25 seconds for consistently high program level. POWER REQUIREMENTS: 115 volts, 50-60 cycles AC, 3 amps. STABILITY: Unit maintains stability of gain, gain reduction and balance over the range of line voltage fluctuations from 100 to 127 volts. 2 Input Gain controls: Step attenuator: 1 db per step. 2 Threshold Controls: continuously variable. 2 Time Constant Switches: 6 positions so as to provide fixed and variable time constants for any type of program material. 2 Metering Switches: 3 positions so as to measure plate current of each control tube, or as a limiting indicator. Mode Switch: A-B positions: 2 independent limiters. Vertical-Lateral position: matrixing input and output, left and right in and out, limiting action vertical-lateral. MECHANICAL DIMENSIONS: Standard 19" rack, 14" panel space, depth behind panel 11"
TUBE COMPLEMENT: 8-6386; 1-6084; 1-5651; 2-12AX7; 2-12BH7; 1-EL34; 4-6973; 1-GZ34(5V4). The model 660 is a single channel Fairchild Limiter. The above specifications apply with the following exceptions: no separation figure needed on the 660; all controls are single, not double as in 670; only half the number of vacuum tubes are used; and an additional 8 DB of gain is available in the 660.
fairchild 670 from Nicolas MIERAL on Vimeo. Looking for the manual? - Check this page above under the heading: 'Product manual or files' - We might have it! Your Name * required field! Add your email if you want replies to any question you post - You will receive an email if someone replies! To receive automated replies be sure to add a valid email address! Comments * required field! - NO weblinks allowed in this feild! My user type is: * required field! Note: To cut down on spammers, cookies must be enabled to post comments to this page. Help support the site & the users music space - Buy via our partner store for EU customers. One fixed price delivery for most items! All contents © to holders - For permissions please register with dancetech and then contact the artist via the site messaging system.